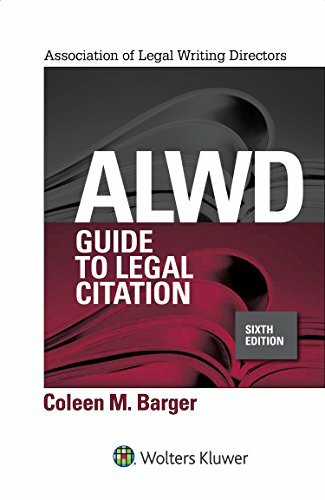 ALWD Guide to Legal Citation, Sixth Edition provides the tools needed for all forms of legal writing, using clear explanations and abundant illustrations. In a single set of rules that the novice and experienced legal writers can easily consult, Professor Barger contrasts the formats used in practice-based documents with those used in academic footnotes. Updated and expanded coverage of public domain case opinions and other primary authorities published online. Updated and expanded coverage of secondary works in online media, including articles, ebooks, blogs, newsletters, and social media. New and updated subsections of rules addressing federal case reporters, statutes, legislation, and regulations online; new treatment of footnote references and footnotes/endnotes in online sources; new treatment and examples of dictionaries, A.L.R. annotations and articles, Restatements, and Principles of the Law. Updated appendices containing abbreviations, jurisdiction-specific sources and local rules, periodicals (more than 70 new titles added); new appendix addressing abbreviations for titles of BD Loose-leaf services. Every rule and example has been revisited and edited for depth and breadth of coverage as well as improved clarity. Shorter than the Fifth Edition (but with the same amount of information). If you have any questions about this product by Wolters Kluwer, contact us by completing and submitting the form below. If you are looking for a specif part number, please include it with your message.